them fit the bike of their dreams, so that they aren’t settling for a bike they happen to fit stock. For more than 30 years, Ohlins has been the premium Motorcycle Suspension supplier the world over. Offering Shocks, Fork Cartridges, Shock and Fork springs for a wide range BMW Motorcycle Suspensions. As an official OHLINS Motorcycle Suspension Dealer, we can sell and install any product from their range for your application. Ohlins offers Ohlins BMW shocks in a few ‘trim’ levels to help match your expectations to your budget. They offer packages that add dynamic ride control with their own dashboard proprietary control unit, or shock packages that plug into the ESA functionality of your existing BMW control system. If you want a massive Improvement in your ride or ride control, fill out our product request form and ask about Ohlins Options! We stock Ohlins shock springs for the Conventional 46 series shocks in all different lengths. We keep expansive inventory on the ‘older’ style Ohlins 1093 series of 2.25” ID springs, as well as the newer 21040 family of springs found on the Ohlins TTX shocks, which is a 2” ID spring, in various lengths and rates. We also keep longer versions for the Adventure touring bikes that come stock with Ohlins shocks like the Ducati Multistrada. Ohlins Shock Springs allow us to ‘correct’ the sag and set up of your bike to you! For a massive improvement in damping control on BMWs with conventional front forks (Non Telalever) we offer the Ohlins fork cartridges. A large fitment guide allows us to offer these cartridges to drop into bikes with absolutely no adjustment and converts them to state of the art forks with Preload, Rebound and compression damping now externally adjustable. Ordered by application with springs custom selected for your weight height and riding style. Similar to most products made in Germany, the Wilbers shocks are meticulously built and as we can expect, have a very strong fitment list when it comes to BMW Motorcycle Shocks. Offering shocks for BMW’s conventional bikes and BMW ESA series of shocks, Wilbers suspension gives us yet another alternative when your expensive BMW ESA shock starts to leak and fail. Available for other bikes too, the Wilbers gives us pre-shortened options that help us when we are lowering bikes here at Accelerated Technologies. Stadium Suspension provides us with excellent shocks made right here in Canada. Able to respond with our requests quickly and efficiently, we are proud to work with Stadium Suspension to exceed your expectations. Stadium makes us great shocks for BMW, Harley, and most Japanese bikes. They offer their 740TR series with rebound and preload adjustability, 740HR1 with a hose mounted rezzy adding compression damping, 740PR1 with a piggy back mounted rezzy, and their 740HR2/PR2 adds high speed compression damping adjustment to the mix for the very discerning rider that loves to tinker. Offering thousands of custom and standard options, Stadium Shock Springs help us tune and set up your bike to you. For BMW’s with conventional forks, Stadium Suspension offers thousands of custom and standard options, Stadium fork Springs help us tune your bike to you. Stadium is our go-to when we can’t get special springs anywhere else. We have been using Hyperpro more and more the last couple years and they have blown us away with their appearance, build quality, and accurate calibrations. This has become one of our go to shocks for our BMW customers. If you don’t want their trademark Purple shock spring, black is available for $15.00 more. In both progressive and straight rate applications, Hyperpro fork springs are available on their own or as part of a Street Box kit with a shock for a more complete motorcycle upgrade. Offering Hyperpro OEM shock springs in Linear and Progressive rates, Hyperpro Shock Springs are custom selected for your street bike, weight, height and riding style. Inside the robust plastic shipping box you will find a Hyperpro Shock Absorber, a matching set of Hyperpro fork springs both custom selected for your weight and a litre of fork oil. The improvement is staggering. During installation, we can service your forks for you, or improve the damping, but even on its own, the Hyperpro Street Box is a wonderful upgrade for your bike. BMW Riders seem to be cut from a different cloth. Their riding season is a least 2 months longer than other riders, and a poor riding year may only see them accumulate 20,000 km! We love our BMW customers, they are motorcyclists to the core. Several of our best customers are on their 4th bike since we have begun working with them! Sending us photos from all over the country and all over the world, we are truly blessed to have them. Our reputation for professionally lowering BMW Motorcycles keeps us very busy with Dealer and word of mouth referrals from all over Canada. 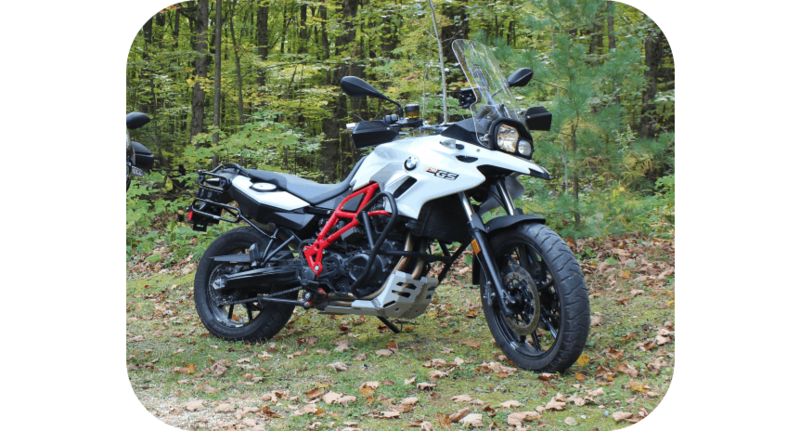 Lets face it, BMW’s, especially the Adventure models, R1200GS, R1200GSA, the touring R1200RT, and even the lighter F650, F700, and the F800’s are all on the tall side and seem to be our more common BMW motorcycle lowering jobs. Not only are these BMW’s tall, but when filled up with fuel and all your gear, they aren’t that light either. Being Tippy Toe on a big bike is concerning, even for a veteran rider. The ground below your feet is rarely flat when rolling to a stop, which causes endless stress, and backing up is next to impossible without a little leg leverage. Whatever the reason or excuse, we gratefully lower dozens and dozens of bikes a year for our BMW customers. The VAST majority of OEM BMW shocks are classified as non-serviceable. We have created a procedure to service and repair stock BMW shocks. We can get these shocks apart, then modify the bodies to be able to refill them with Nitrogen to make them permanently serviceable from that point forward. Similar to our procedure developed to service OEM BMW shocks, we have taken the process one step further and have developed a process to repair Failed BMW ESA shocks. We receive many calls a year from customers that just collapsed on the floor at their BMW dealer’s parts department after hearing that a replacement shock is $2200, $2600 or even $3000!!! The annoying thing is that on some of these models, hidden under the electronic servo motor that adds preload, and the electronic driver that adjusts the damping is a fairly low quality, definitely low-cost shock. We are able to remove the electronic motors and drivers and repair the core shock at a fraction of the cost of replacing the whole unit. If this is you, please get in touch for an estimate. For not a lot more money, we can replace the core failed shock of your Leaking or Failed BMW OEM shock with a much higher quality inner damping unit. From our suppliers Wilbers and Hyperpro, and even Ohlins, we can dramatically improve the inner damper while fixing the leak at the same time. These replacement shocks (more accurately dampers) are aluminum bodied, fully serviceable and revalveable shocks that will improve the damping and ride over your stock OEM shock. Please contact us for an estimate. A very economical option to make a significant improvement to the ride of your BMW Motorcycle Suspension is to replace the inner core damper of your BMW OEM shock with a much higher quality inner damping unit. From our suppliers Stadium, Wilbers, Hyperpro, and even Ohlins, we can dramatically improve the inner damper and replace it with a damper that CAN be easily serviced anywhere in the world. These replacement shocks (more accurately dampers) are aluminum bodied, fully serviceable, and revalveable shocks that will improve the damping and ride over your stock OEM shock. Please contact us for an estimate. Get the setup you and your BMW deserve.